I loved pulled pork. I also love pulled beef brisket. My favorite part of the brisket is the point, the fatty top portion that usually melts and falls apart when you grab it. 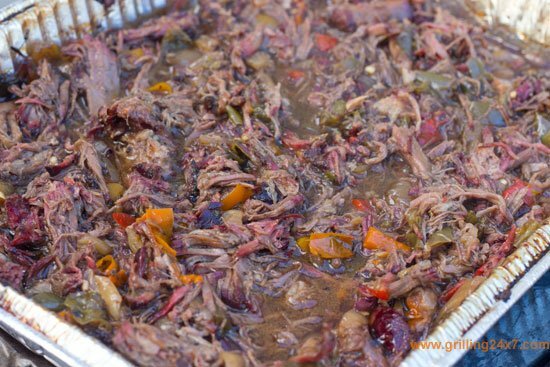 It’s amazing and tender pulled beef BBQ. I saw that a bunch of my online BBQ friends, such as Joe, who writes www.mmmgoblubbq.com, were smoking chuck roast and then foiling it tight in a mixture of peppers and onions. This really appealed to me as a quicker and easier way to obtain pulled beef, rather than fuss with a brisket. Then I noticed that some people were referring to these as “chuckies!” What a great name! 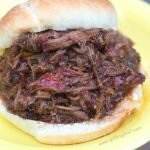 Here’s my spin on the easier, more forgiving way to have pulled BBQ beef: smoked pulled chuck roast with a stout BBQ sauce. The general plan here is to rub a chuck roast with salt and pepper and then smoke it until it reaches about 165 degrees (about 2-3 hours). 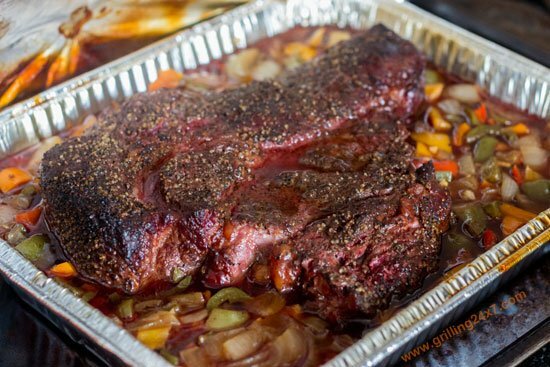 Then place the smoked chuck roast on a bed of chopped peppers and onions and cover with foil in a tin. Return to the tin to the smoker for 2-3 more hours until the chuck roast is extremely tender. Finally a BBQ sauce will be made right in the same tin and returned to the smoker with no foil cover. 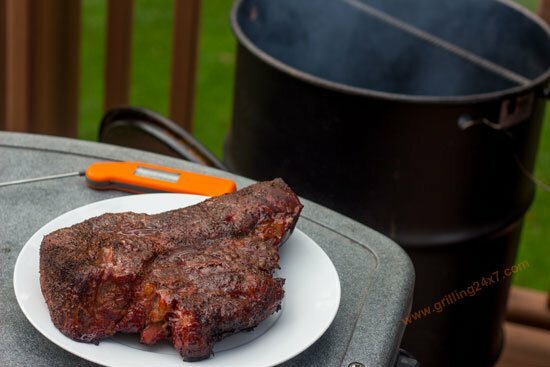 This will result in tender, smoky, well flavored BBQ beef. A BBQ Chuckie sandwich! You can find big chuck roasts easily. Packs of two are even sold at Costco. 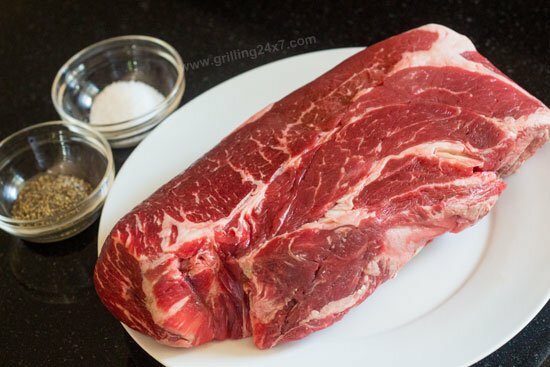 The key to your chuck roast selection is to pick one that is about 4 lbs and about 1 or 1.5 inches thick. Look at this baby! 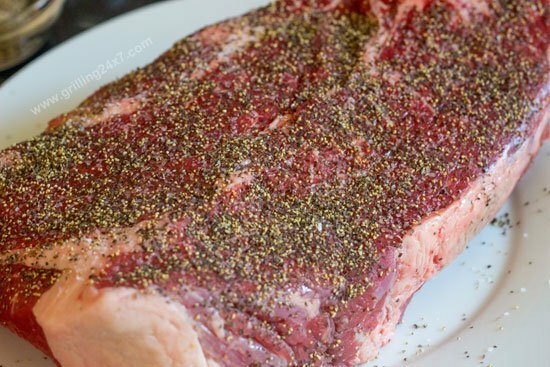 For the dry rub cover the chuck roast with salt and pepper. No rules on how much, just cover it with a lot of salt and pepper. 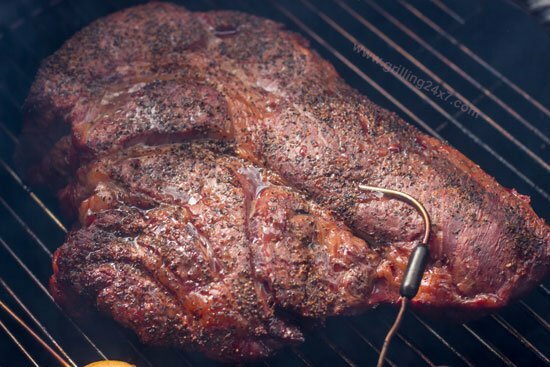 Light the smoker for typical BBQ temperatures. 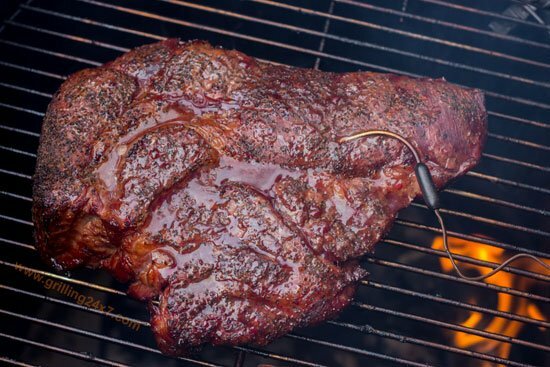 You’ll be fine with any temperature ranging from 250-300 degrees F. Place the chuck roast on the smoker with a temperature probe in the thickest part of the meat. 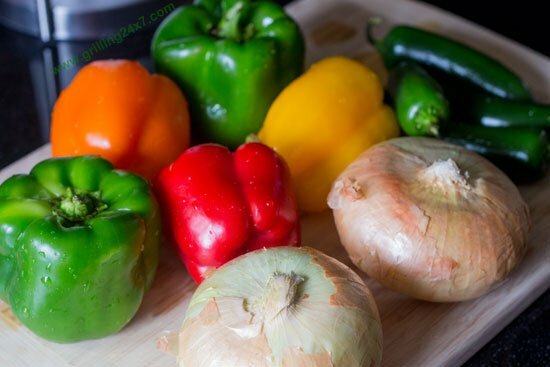 For one big chuck roast, I used 2 green peppers, 1 orange pepper, 1 red pepper, 1 yellow pepper, 2 sweet onions and about 4 jalapeno peppers. I also chopped up about 6-8 cloves of garlic. You can use any combination of pepper colors that you like. Once the peppers, onions and garlic are chopped, set them aside and check on that chuck roast. Not done yet. 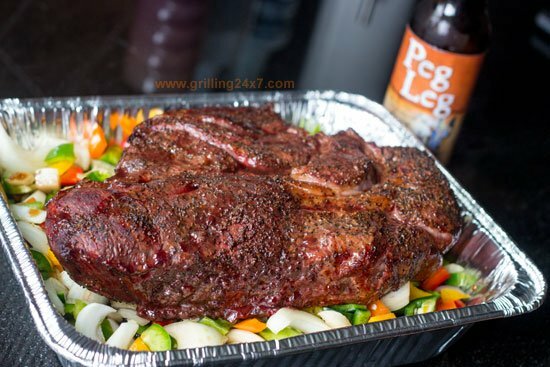 The above photo shows the chuck roast at about 145 degrees F.
After a few hours the chuck roast had an internal temperature of 165 degrees F. Time to sit it on the bed of peppers and onions and foil it. For this smoke I used my Pit Barrel Cooker. I laid the meat flat on the grate for the cook. I of course double checked the internal temperature with my Orange Thermapen. 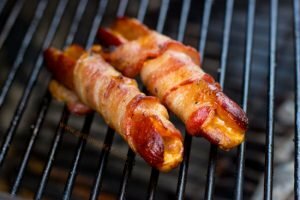 Part of the concept of foiling meat is to create a moist steamy environment which really accelerates the cooking process. The fat in the meat as well as the water in the chopped veggies would be sufficient, however, I dumped a whole Peg Leg Imperial Stout beer into the mix. Return this to the smoker for about 2-3 more hours. Don’t peek. After a few extra hours the roast will still look the same but will be fork tender. Go at it and tear that thing apart! It looks gorgeous and it tastes fantastic at this point. Most recipes stop here. But for my taste, this needed some extra work. It had a bit of a plain pot roast thing going on, in my opinion. 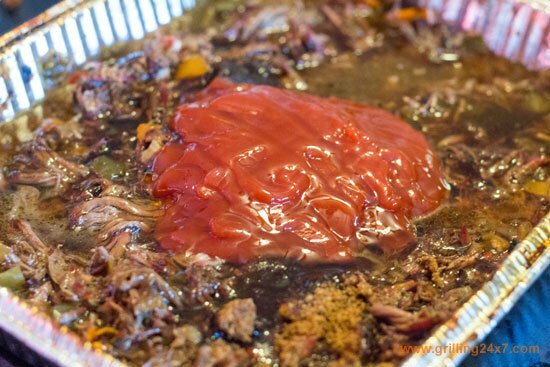 To overcome this the next step is to build a BBQ sauce right into the meat mix and then expose it to smoke again. One of my favorite BBQ Sauces is my Peg Leg Imperial Stout BBQ Sauce that I came up with a while back. It’s simple. I adjusted the sauce recipe so it can be made right into this glorious mix of peppers, onions and shredded BBQ beef. To the mix add 3 tablespoons of Worcestershire sauce, 1 cup ketchup, 1/2 cup apple cider vinegar, 1/2 cup brown sugar, 1/4 cup honey, and 2 tsp black pepper. Mix everything up and return to the smoker with no foil lid. Got that? No foil lid. After 30 minutes it looks like this. Not too much different from the earlier unsauced version, but now it has a rich, sweet tomato based BBQ sauce worked into it. 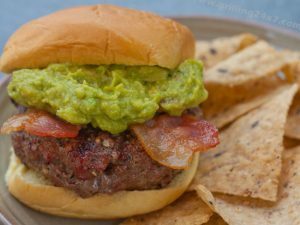 Grab a heaping amount and place it on some soft fresh buns. And there it is… the Imperial Stout BBQ Chuckie sandwich. This has easy tailgate written all over it because all of the work can be done before the tailgate and it can be reheated at the game. 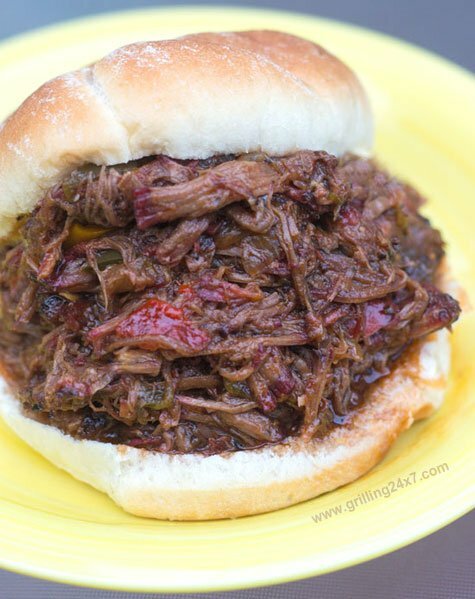 A recipe for a BBQ chuckie sandwich with peppers and onions and an Imperial Stout BBQ sauce. Light smoker for 250-300 degrees F. Cover roast with salt and pepper. 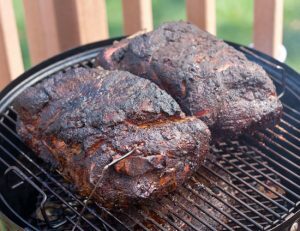 Smoke for 3 hours or until meat gets to about 165 internal temperature. 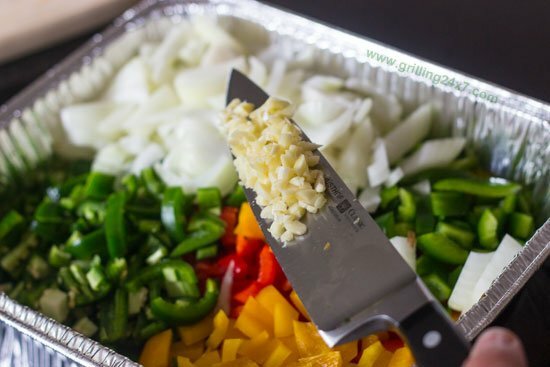 Place roast in an aluminum tin with chopped peppers, onions, jalapenos and garlic. Add one whole imperial stout beer. Cover tightly and return to the smoker for another 3 hours. Using two forks, pull the tender beef and mix well. To build the imperial stout BBQ sauce add the ketchup, Worcestershire sauce, honey, brown sugar, pepper and apple cider vinegar to the beef mix and stir well. 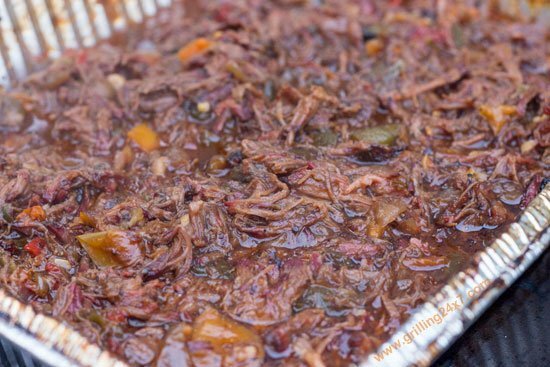 Return the sauced pulled beef to the smoker with no foil for about 30 minutes. Add pulled beef to a soft fresh roll and enjoy. OMG and I don’t do the OMG thing… I have 2 chuckles and im doing this tomorrow. THANK YOU!!! Great recipe! Made it for a party, and people went back for thirds. Followed the recipe almost exactly as described. I only had a few notes worth mentioning for other people making this for their first time. First would be that I ladled a bit of the liquid from the pan after the braise. Not sure if my roasts were just exceptionally juicy, but the liquid almost filled the pan. I took out about half, and then added the BBQ recipe. I think this worked out for the best in this case, because the beef was still quite wet when complete. Also, I assumed the author’s meat stalled at 165F, so that’s when he moved it off to the foil pan. Large cuts of meat succumb to a temperature “stall” when they reach temps just above 150F. I smoked for a little over 3 hours, but my meat stalled at 155F. (I was doing two 4.5ish lb roasts in a Weber Smoky Mountain for reference). Once I realized they had stalled, I moved them to the pan to crutch them the rest of the way. The directions didn’t mention it, but I re-inserted the temp probe into one of the roasts during the braising section because I wanted to take the roasts off when they hit about 203F. From my understanding, going past 205F just starts drying the meat out, but around 203F all the collagen starts to dissolve. It took just under 3 hours, so the directions were pretty spot on. Putting the mix back on the smoker was a great idea. Every piece of meat got a nice smokey taste to it, and the sweet BBQ sauce worked great with it. Will be making this again. Made this today and everyone loved it. I cooked it at 225 for about 10 hours and crutched it at the stall (162 for me) after 6 hours. Thanks for sharing. rarely come across a recipe that works. explained well and the pic. are great. great idea with the sauce added. eyeing up your others as well, great find! !